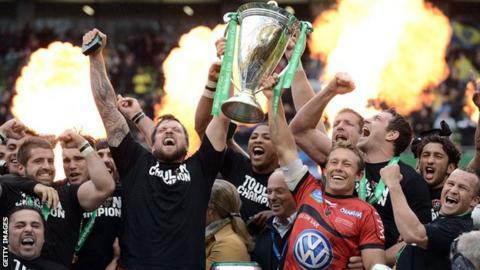 The European Rugby Champions Cup which replaces the Heineken Cup has been given the go-ahead for next season. Unrest over the future of the Heineken Cup began in June 2012, when the English and French clubs announced they would quit, unhappy with qualification, revenue distribution and governance. Soon after, Premiership Rugby signed a TV deal with BT, while ERC extended its deal with Sky. In October 2013, the English and French clubs announced they were setting up the Rugby Champions Cup, which had the support of the Welsh regions. When the French clubs pulled out, an Anglo-Welsh league was at one stage a distinct possibility. For much of the last year prospects looked bleak, but this new agreement secures European club competition for at least eight years. Bill Beaumont, chairman of English governing body the Rugby Football Union, said: "We are very pleased that the challenges off the pitch are concluded so we can enjoy the joys of the game on it, creating more unforgettable memories for players and fans alike." His views were echoed by officials throughout the European game, with Welsh Rugby Union chief executive, Roger Lewis saying he is "delighted that we can all move forward with a clear and agreed structure in place for European competition from next season". The signatories are the unions from the Six Nations countries, plus the club bodies for England, France and Wales. Mark McCafferty, the chief executive of Premiership Rugby, described it as a "historic day for European club rugby", adding that the parties involved "had worked hard to get to this point and the uncertainty is now over". International Rugby Board chairman Bernard Lapasset said the new competition meant both players and fans could "look forward to a strong competition structure that promotes and celebrates the best of the European game". And Ian Ritchie, chief executive of the RFU, added: "This equitable, long-term agreement will provide the platform for rugby union to continue to expand across Europe, increasing interest and involvement in the game at all levels." The tournaments will be headed by European Professional Club Rugby, a new Swiss-based association, which will replace current organisers European Rugby Cup (ERC). Pro12 representation is cut from its current 10 teams, with one guaranteed representative from Ireland, Italy, Scotland and Wales and the other three places being decided on league position. ERC chief executive Derek McGrath confirmed he will stand down from his role in October 2014 following the decision.